Replace disposable water bottles with reusable ones. There are several hydration stations you can use to refill your bottles. Buy items with little to no packaging. Reusable bags are a great way to keep plastic bags from ending up as litter and in the ocean. These are very simple tips you can do right away to save energy. Save energy by getting rid of your office or dorm mini-fridge and using a common refrigerator instead. Put common area equipment like printers and copiers in standby or energy saver mode when not in use and turn them off at the end of the day. Turn off lights every time you leave a room and make sure lights in all common areas are turned off at night and when not in use. Donate or recycle that personal printer and use a more efficient centralized printer instead. Following these steps will reduce the amount of paper and ink you use every day. Set your printer default to double-sided printing if you have the ability to do so. Collect scrap paper in a bin to reuse (Do not use scrap paper with private health information). Use the print preview feature to avoid unnecessary printing. With the dreaded Los Angeles commute, carpooling and vanpooling is a great way to get to and from work through this busy and congested city. You are not only avoiding the stresses of being stuck in the daily gridlock, you are also helping reduce the amount of pollutants that enter into the atmosphere from transportation. Traveling between Ronald Reagan, Wilshire Center, and Santa Monica? Staff shuttle services are available and they arrive at each location every 15 to 30 minutes. My Smart Phone is Outdated, It's a Month Old! According to the U.S. Environmental Protection Agency (EPA), Americans discard 125 million phones each year, creating 65,000 tons of waste. Throwing electronic waste in the trash is bad for the environment. Electronics contain hazardous materials, such as, lead and chromium. Making sure they are disposed of properly will avoid land, air, and water pollution. Your old phones, computers, or other electronics can be taking to an electronic recycling center. You can also bring your electronics to the UCLA S.A.F.E. (Solvents, Automotive, Flammables, Electronics) Collection Center available on Thursdays, Fridays, and Saturdays 8:00 am to 2:00 pm. Another option for your old cell phone is to take it to a local wireless communication provider. Many providers offer take-back/donation options. 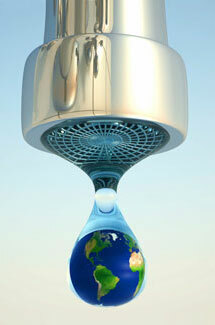 Leaky faucets can waste thousands of gallons of water each year. If you see one in one of our facilities, contact Health System Facilities by logging on to the Support Services Center website and place a service request. Reusable bags are a great way to reduce waste. According to the EPA, 88 percent of single-use plastic bags never get recycled. They are not only an eyesore on the side of the road, they are often found in the ocean causing negative impacts to sea life. Many grocery and super stores offer an incentive for using reusable bags, usually 5 to 10 cent discount per bag from your total purchase. TIP: leave a set of bags in your car so you don't have to remember to take them with you each time you shop. Bring your lunch to work in a reusable bag. This is common already, but I have seen people using single-use bags for their lunches. Although it's nice they are reusing the bag, it is likely it will be thrown out with their lunch.